The concern over Shariah-compliant transactions is firmly entrenched in the activities and operations of Islamic financial institutions (IFIs). As a business entity established within the ambit of Shariah, an IFI is expected to be guided by values, principles, objectives and rulings of the Shariah. However, ensuring effective Shariah compliance is not a straightforward matter. As financial markets become increasingly sophisticated, heightened product innovations and engineering in Islamic finance entail genuine concern over the need to strengthen Shariah compliance throughout the product life cycle. This means that, while a product may be deemed Shariah compliant prior to its launch (ex-ante), the IFI must also be cognizant of the need to ensure that the entire ex-post process—including contract execution, utilization of funds, investment activities, the audit and governance process—are all in place. 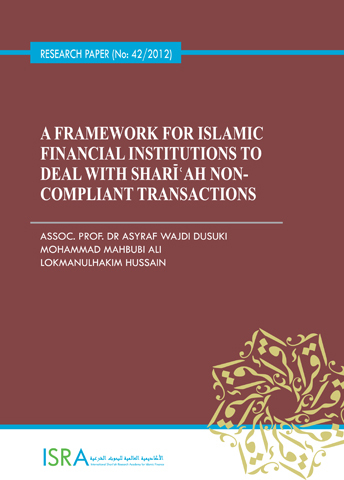 This paper focuses on the framework for dealing with Shariah non-compliant transactions in Islamic finance. The framework delineates the concept of illegitimate income and its sources from the Islamic perspective in order to develop a coherent approach to dealing with diverse non-compliance situations based on established principles of the Shariah. Although it is not expected that an IFI will deliberately involve itself in illegitimate activities, any incident of non-compliance needs to be immediately addressed, rectified and reported. This is not only to ensure the purity of the income earned but, more importantly, for IFIs to put in place adequate systems and controls to ensure such that non-compliance with Shariah rules and principles can be averted.